What Is Liquid Nitrogen & How Is It Produced? I'll let the professionals handle this one. Says Molecular Gastronomy Network, "The air we breathe is composed of approximately 78% nitrogen in its gaseous state, against 21% oxygen and 1% various other gases. To produce liquid nitrogen, the air is first liquefied and the nitrogen is then separated by distillation. Since the boiling point of nitrogen is -195.8°C (-320.5°F), liquid nitrogen is extremely cold, it's a liquid said to by 'cryogenic.'" What Is Its Purpose in a Kitchen? Because liquid nitrogen is so incredibly cold, it is used to freeze foods, which it can do almost instantly. But, with the exception of televised competitions where time is a factor, the speed at which liquid nitrogen can freeze foods is not its selling point. Instead, it's how liquid nitrogen freezes foods that makes it such a dynamic "ingredient." When foods are frozen in a traditional freezer, they form relatively large ice crystals, which impact the consistency of the product. By comparison, liquid nitrogen forms microscopic ice crystals, which can create frozen foods with an almost unbelievably creamy consistency. As such, liquid nitrogen is commonly used to make gourmet restaurant ice creams, as it provides a more velvety texture than any ice cream machine can. Even more famously, however, liquid nitrogen is used to freeze ingredients (such as berries, citrus, herbs, and honey); the substance makes these ingredients so cold and brittle that they can be broken into tiny pieces, or even crushed into a powder (which is very trendy at haute cuisine spots). Imagine trying to break a raspberry that you froze in the freezer: it would squish, thaw, and turn into a mass of pulp. 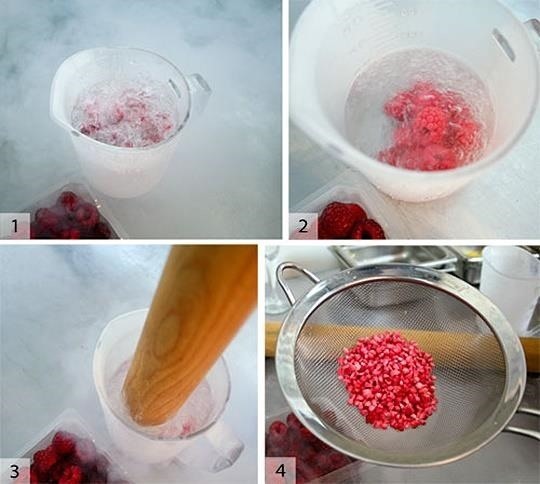 But with liquid nitrogen you can make little beads of frozen raspberry, or raspberry powder. As you likely know, alcohol's freezing point is lower than the temperature of your freezer. Therefore, liquid nitrogen does what your freezer cannot: it can freeze alcohol. That means it can be used to make extra-cold cocktails, cocktail slushies, or alcoholic ice cubes. 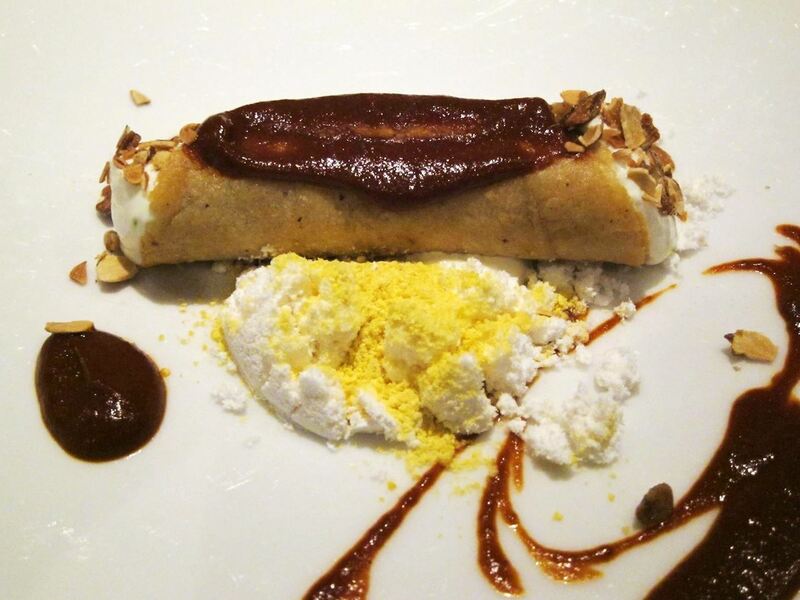 This is commonly practiced in high-end restaurants where chefs will freeze alcohol-based solutions and place them in the middle of desserts for an alcoholic filling that would otherwise be unobtainable. Another fun way that liquid nitrogen is used is to make homemade "caviar." Chefs will drop flavorful liquids into a bath of liquid nitrogen; the flavored liquids will freeze instantly into perfect beads, making for a magical garnish that looks nearly identical to caviar. 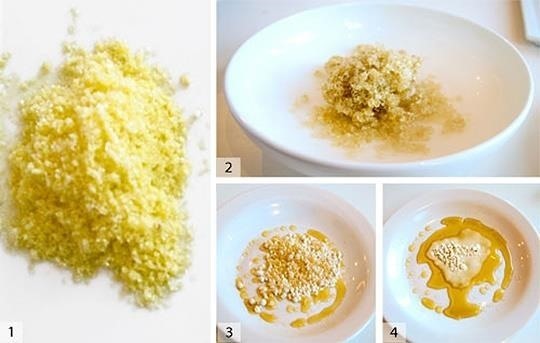 You can also use this technique to make homemade Dippin' Dots! It seems counterintuitive that you could dunk food into liquid nitrogen and then eat it, but you can! As soon as liquid nitrogen has cooled your food, it evaporates, and all that's left is your frozen food, texturally altered, but not flavored or poisoned in any way whatsoever. Liquid nitrogen will always rise to the top, so chefs have to add the food to the liquid nitrogen, and not the other way around (otherwise only the top of the food would freeze). In the case of ice cream, they have to mix the solution while adding liquid nitrogen, to make sure that all of the ice cream mixture comes into contact with the liquid nitrogen. It goes without saying that something -320.5°F is not the safest thing to have lying around, and it's the main reason why you won't find a canister of liquid nitrogen at your local Trader Joe's. In fact, there is special equipment made specifically for handling liquid nitrogen: temperature-resistant gloves and eyewear. 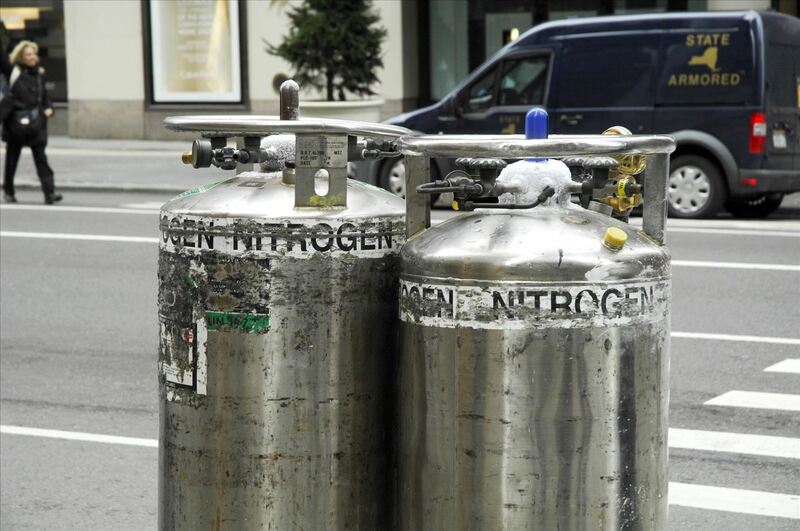 However, this isn't always used, as proper safety canisters and execution can make using liquid nitrogen very safe. That said, one of the coolest things about liquid nitrogen is that despite its extreme temperature, it won't hurt your skin if a little comes into contact with you. When it comes into contact with your skin the thermal shock reverts the liquid nitrogen into a gaseous form, a phenomenon called the Leidenfrost effect. That does not mean you don't need to exercise extreme caution; if it comes into contact with your clothing it will immediately freeze it, and you will feel the (extremely painful) consequences (and your eyes do not have the same reaction as your skin does). The biggest safety concern, however, is proper ventilation. If liquid nitrogen is kept in a fully sealed container it can be extremely dangerous; the pressure will rise and the container will explode. And as liquid nitrogen is used, it expands into a gas that is 700 times the size of the liquid form. This pushes the oxygen out of the room, which means that, without a properly ventilated kitchen, you can suffocate yourself by using liquid nitrogen. And, since food frozen by liquid nitrogen is extremely cold, it has to be thawed to a normal freezing temperature before it can be safely consumed. 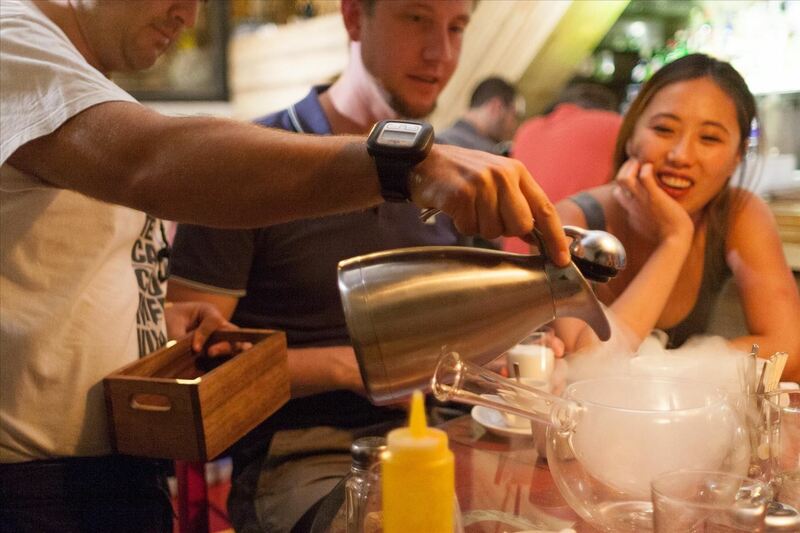 Can You Use Liquid Nitrogen at Home? The short answer is yes, but the long answer is: not without a professional chef supervising you every step of the way. If you want to freeze foods in a similar matter at home, I suggest you check out the Anti-Griddle instead. You won't be able to make ice cream with it, but there are easier ways to do that anyway.